Caleb and Nathan Followill: New York City makes them feel just "beach-y"
Kings Of Leon were insisting that they were going to take some serious time off, but instead they're completing a new album and touring all summer long, with a 32-date US tour booked and dates at the V Festival and Hyde Park. 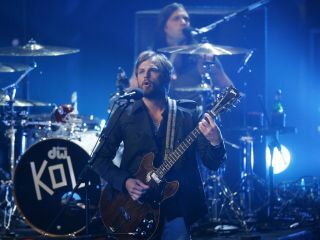 "The record is coming along great," drummer Nathan Followill said during a conference to promote KOL's appearance at the Bonnaroo Festival. "It will be tough to not play the whole [new album] at Bonnaroo. We're going to try to be very selective of what we play, but there will definitely be some new tunes." The band has been working on the new disc in New York City since April, and the drummer told Spin, "[It's been the] first time we ever recorded in New York City and we thought we'd come out with a darker record because we'd done all our records in either Nashville or Los Angeles where it's a little more chilled out. [But] I'll be damned if we didn't go in there and make a fun record! "It's got songs that are beach-y and songs that are a little more like our [2003 debut album] Youth And Young Manhood days. We're super excited. It will be interesting to see how well received it is." "Fun, beach-y" songs from a Tennessee band working in New York City. Who'd a thunk it?